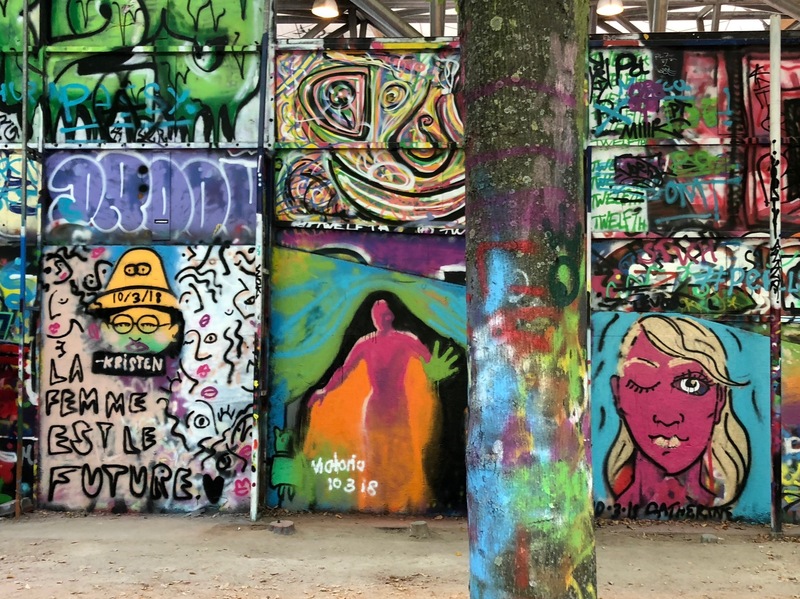 On a trip to Paris this October, two friends and I signed up for a street art lesson at a place where it’s legal. The instructor had to cancel last minute, so we decided to go for it ourselves. We went to a hardware store and each bought 3 cans of paint to share. We then walked to the skatepark mentioned in the class info. We spent a stupid hour being too spineless to do anything. Thankfully, a mural instructor arrived to give someone else lessons, and he confirmed that the entire structure was safe and legal to spray. So finally, spray we did for the next 2 hours. 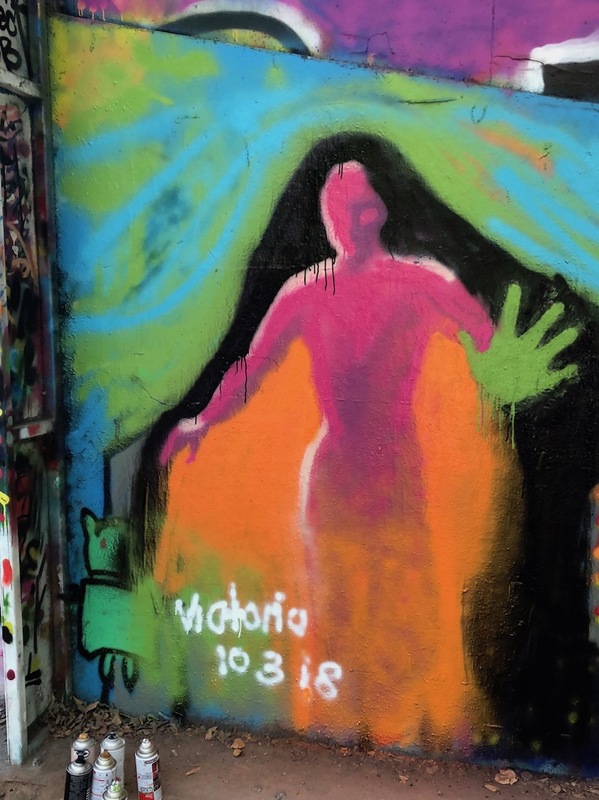 My friends’ interpretation of my painting was that it was a firey volcano woman emerging thunderously from a mountain, a feminist statement like the murals they made. I appreciated how this fit in between Kristen’s cubist collection of femme faces and Catherine’s bold self-portrait. I didn’t have the heart to share my own less positive meaning. Being on an adventure with friends in one of the most romantic cities was a weird place to be sad. Still, it was a highlight of my art-making life, and now I can’t wait to find a proper place to do this in Portland. 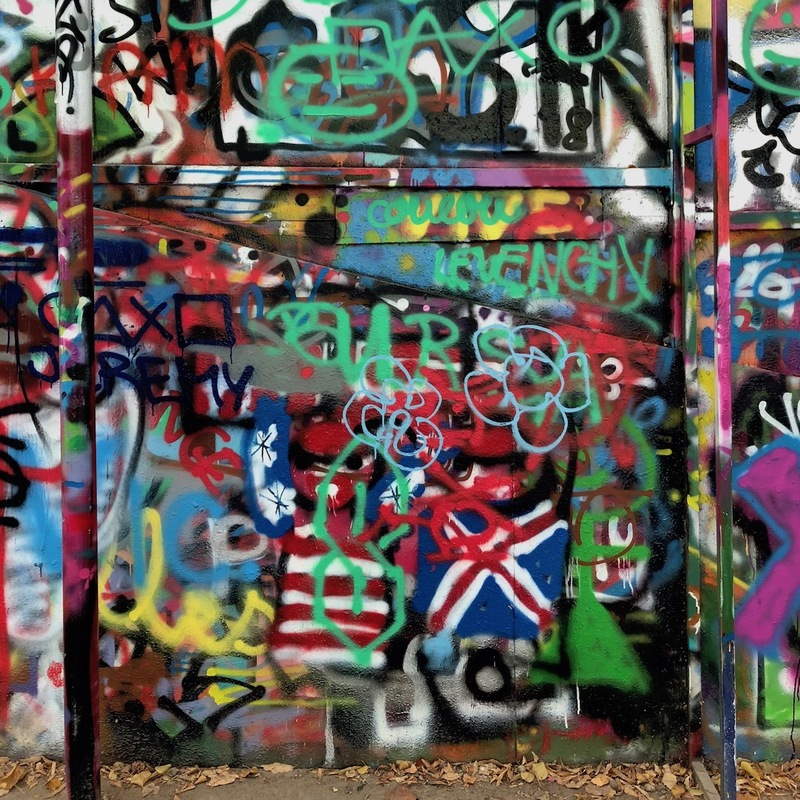 (I’ll start by checking out this structure maintained by a local street art group.) Next time I’ll be more prepared—the tainted lungs and sore forearms were a funny part of this experience, but it’ll be great to have a face mask and a grip-style spray can holder next time. Gloves are important for me as I can’t help using my hands as blending tools, and I want to get the special caps with slower flow, as I had run out of paint during my heavy application. Some kind of stenciling material could be fun. The neon colors I chose this time were hard for me to work with, so next time I’ll have primary colors and more neutral shades ready. I’m sure there are multiple layers of paint on top of my painting now, but just knowing that mine is somewhere under there is enough for me. No graphics editors were awoken over the holidays in the making of this little blog layout. I designed it primarily in the Firefox Inspector, overriding the styles of the Minimal theme in jekyll-now. The headers use a photo of an acrylic painting I made in 2015. I had some good fun with CSS blend modes and background-clip. I’m now using my domain name, violasong.com, with my GitHub pages site. The term “violasong” (which creepily autocorrects to “violating” and confuses people by sounding like a Asian American woman’s name (“Viola Song”) so some people think it’s my actual name) came about in 2004 when I first registered a domain name for my website. It refers to the viola, an instrument I (rustily) play. There are very few songs written for the viola. It’s an odd phrase but it fits. Things have gotten a lot easier since the last time I rebooted my blog. Years ago when I used MovableType, blog-making involved many hours of work importing from other blogs, mucking around in MySQL, hacking changes into the Perl backend, and messing with .htaccess. This time, I’m starting fresh with the fantastic jekyll-now project for GitHub Pages, and I’m editing this using the prose.io authoring tool. I’m really impressed with how smoothly it all works. Posting personal thoughts on the internet is pretty challenging for me—I often agonize over how to word a 140-character tweet. As somewhat of a perfectionist, it’s uncomfortable to put myself out there in a system that feels so permanent and widely accessible. I was grateful for the recent opportunity to write for the Firefox Nightly blog about the DevTools visual refresh—it stretched some very dormant muscles and it felt good to communicate about my work in a structured way. Some more writing about design may be fun, and I’ll probably talk about art, video games, and life in Portland. Once things get rolling, it’ll be nice to discuss the ideas I listed in my existing personal site. My biggest rule for this blog is to keep posts short and imperfect so that I don’t go another many years without blogging. Let’s see what happens!